To ensure the safety and relaxation of all of our guests, please observe the following campground rules. Our quiet, peaceful, relaxing, clean, safe, family-friendly environment is of the utmost importance. Park guidelines are based on common sense, common courtesy, and the best interest of the park. Contact the office with questions. Please report all problems to the office immediately. If a problem occurs after hours, please call the emergency phone number listed on our site map. LATE ARRIVALS: Do not disturb your neighbors. No arrivals past 10:30 p.m. Check-in at the office by 10:00 a.m. the following morning. Should you fail to register, we will automatically charge the card we have on file for your entire stay. If this occurs, NO DISCOUNTS/COUPONS WILL APPLY. ALCOHOL: NO public displays of alcohol. Anything jeopardizing Pecan Park’s quiet, peaceful, relaxing, clean, safe, family-friendly environment will not be tolerated. SITES: Do not disturb your neighbors. NO TENTS/NO EXCEPTIONS. No canopies/screen rooms/etc. with bottoms are allowed. No outdoor carpets except on your patio. No jacuzzis. Do not trespass through any site that is not your own. Do not litter, this includes cigarette butts. No clotheslines. Do not attach anything to park property, including trees. Cutting of trees and plants is prohibited. Keep the volume of your music within the confines of your site. No generators. No fireworks. Please leave your campsite clean. WATER USAGE: We are under water restrictions. Do not let water run unnecessarily. You may NOT wash your rig or vehicle without permission from the office. SPEED LIMIT: 5 1/2 mph. For your continued stay, obey all posted traffic signs. CAMPFIRES: Check with office for current burn ban status before burning. DO NOT MOVE FIRE RINGS. If you bring your own fire ring, it must be up off the ground (with a lid under certain burn bans). No makeshift containers. You may purchase firewood in the office. Free delivery. NO OUTSIDE firewood. CARS: WE TOW!!! No more than two vehicles are allowed at each site. Parking on grassy areas or on concrete patios is not permitted. $5 per vehicle per day if violated. Parking tags must be displayed at all times. Absolutely NO parking on river/movie hillside. CHILDREN: Parents/guardians are responsible for their children and damage caused by their children during their stay. DO NOT TRESPASS on other people’s RV sites. Adults must accompany children under 14 in the pool, river, and playground. Bicycles are welcome on the roads, but not across common areas, narrow paths, or across other RV sites. POOL AND HOT TUB: Pool hours: 10 a.m. to 9 p.m. TEXAS STATE LAW: No lifeguard on duty; children under 14 must be accompanied by a legal responsible adult 18 years or older. NO ONE UNDER 18 allowed in the hot tub. VISITORS: All visitors and vehicles must check-in/register with the office. 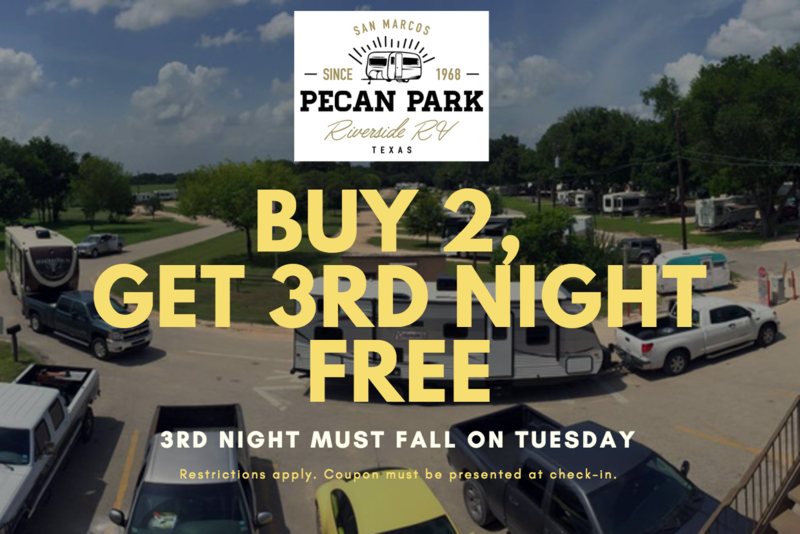 Visitors are the responsibility of Pecan Park registered campers. Max 8 persons per site, including visitors. $50 per person per day for unregistered people. GARBAGE: No curbside trash service. Dumpsters located at either end of the park. Do not leave garbage outside overnight. WEAPONS: The display or user of weapons is not permitted. This includes pistols, rifles, pellets, BB, swords, etc. or any replications of such. We tolerate no illegal activity. OTHER TRANSPORTATION: NO GOLF CARTS/ATVs. Motorized vehicles are to be used only for transportation, not for “recreation.” Bicycles are welcome on the roads, but not across common areas, narrow paths, or across other RV sites. PETS: Pets must be registered with our office (breed restrictions apply). Your pet must be on a 6-foot or less leash at all times! NO EXCEPTIONS. You must clean up after your pets. Do not allow your pet to wander from your site. You may walk your pet only in designated areas. NO PETS IN POOL AREA, GAME AREA, BUILDINGS, OR RESTROOMS. Pets must not be left unattended. Incessant barking will not be tolerated! NIGHT OWLS & EARLY BIRDS: QUIET HOURS: 10:30 p.m. to 7:30 a.m. Children must return to their site. No electronic noise. Voices must be kept to a whisper. No exceptions. No generators. REFUNDS: Sorry, no refunds for rain, no extra charge for SUNSHINE! In the event the park needs to close due to inclement weather or other emergencies, we will provide you a credit for your stay of those funds not used. The credit will be good for one year from date of issue. No refunds for early departure. 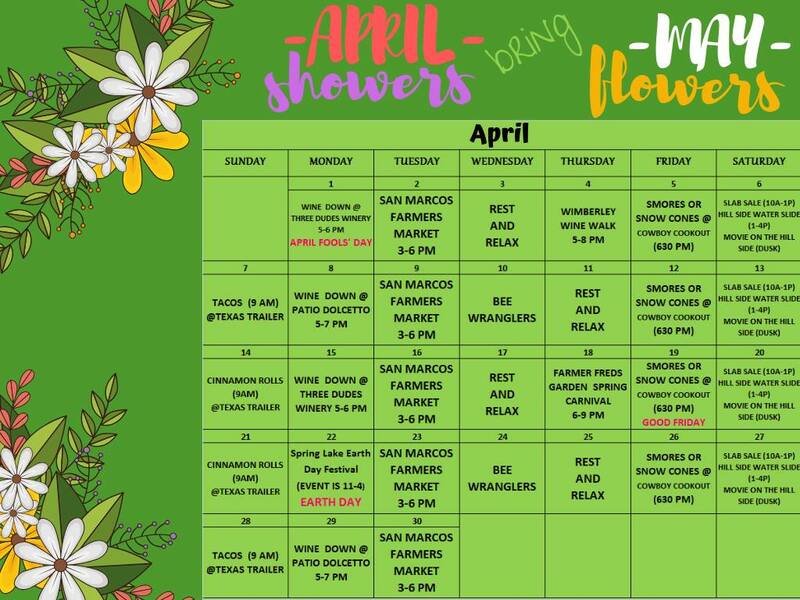 SAN MARCOS RIVER RETREAT: DO NOT ENTER their property for ANY reason unless you have registered in their office. An alcohol-free camping facility not open to the paying public. 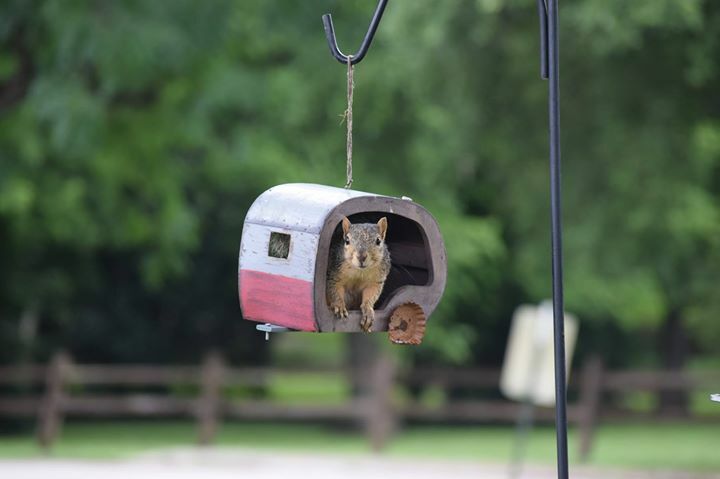 We hope you enjoy your stay at Pecan Park Riverside RV Park!